The eThekwini (ett-ta-kweeny) Muncipality Water and Sanitation Department, Durban’s water and waste management provider, avoided huge and expensive equipment, big pipelines, and the complicated sewage disposal practices of centralized water and sanitation systems. Instead it deployed a decentralized strategy, partnerships, baseline research, and less expensive tools that worked. The centerpiece of Durban’s program for the time being is the “community ablution block” public washroom. It is an ordinary marine cargo container refitted inside with running water in sinks and wash basins, toilets, and showers. Durban has 2,500 ablution blocks installed in many of its nearly 500 informal settlements. There is sufficient public funding to fabricate and install perhaps 80 more annually. 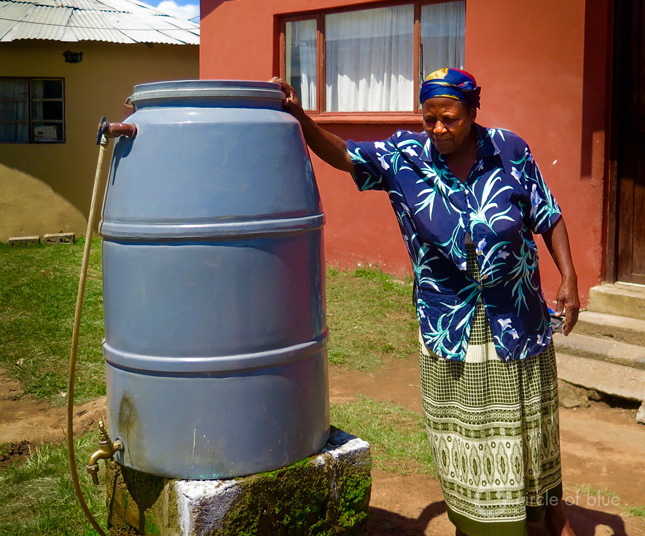 Other innovations are the 85,000 urine-diverting toilets, standpipes, and water storage tanks installed outside settlement homes, a mobile sludge processing plant that sterilizes waste hauled from toilets and yields usable compost, and an aggressive program to clean wastes from pit toilets and then replace them. Photo Credit: Used with permission courtesy of Keith Schneider/Circle of Blue.